As I wrote in my last blog, we started to grow Aloevera, and we were lucky, because we discovered that the kind of the Aloevera plant we nurture is the Barbadensis miller, which turn to be the best kind of Aloevera used in cosmetics and for inner body treatments. Clinical evaluations have revealed that pharmacological active ingredients are concentrated in the gel of the Aloevera leaves. These active ingredient been shown to have analgesic and anti-inflammatory effects. Aloevera is known to be anti-septic, anti-viral, anti-fungal and anti-microbial. Over the years, the plant has been known by a number of names such as ‘the gift of heaven’, ‘heaven’s blessing’ and ‘the silent healer’. 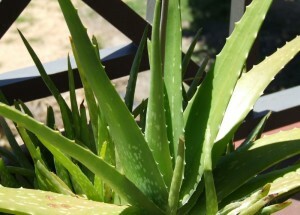 There have been many reports of the healing power of Aloevera. The Aloevera gel, inside the green leaves, is made up of over 75 different ingredients, the nutrients include Vitamins C, E, Beta Carotene, B12, Minerals magnesium, manganese, zinc, copper, chromium, calcium, sodium, potassium, iron. Amino Acids, 20 out of the 22 required by the body as the building blocks for protein and 7 out of the 8 that the body cannot manufacture itself, Sugars including long chain polysaccharides that help boost the immune system, Enzymes – to help break down and digest food. Plant Sterols, that act as powerful anti-inflammatory agents. Lignin, a woody substance that helps Aloe penetrates the skin Saponins, soapy substances with an anti-microbial effect, Anthraquinones, powerful natural painkillers. Salycylic Acid, anti-inflammatory, helps break down dead tissue! Aloevera contains 19 of the 20 amino acids required by the human body for good health. The 8 outstanding amino acids – known as ‘essential‘ amino acids –required by the human body have to be taken in as food and drink. Aloevera contains 7 of the 8 ‘essential’ amino acids: Isoleucine Leucine Lysine Methionine Phenylalanine Threonine Valine. The 12 ‘non-essential’ amino acids contained in Aloevera are: Alanine Arginine Asparagine Cysteine Glutamic Acid Glycine Histidine Proline Serine Tyrosine Glutamine Aspartic Acid. Aloevera contains 12 anthraquinones: Aloe Emodin Aloetic Acid Aloin Anthracine Antranol Barbaloin Chrysophanic Acid Emodin Ethereal Oil Ester of Cinnamonic Acid Isobarbaloin Resistannol. These 12 Phenolic compounds are found exclusively in the sap of the Aloevera plant. In small quantities, when they do not exert their purgative effect, they aid absorption from the gastro-intestinal tract and haveanti-microbial and pain killing effects. Anthraquinones also provide anti-bacterial, anti-fungal and anti-viral activity. Aloevera contains 8 enzymes: Aliiase Alkaline Phosphatase Amylase Carboxypeptidase Catalase Cellulase Lipase Peroxidase. These enzymes contained in Aloevera help the breakdown of food sugars and fats aiding digestion and enhancing nutrient absorption. One in particular, Bradykinase, helps to reduce excessive inflammation when applied to the skin topically and therefore reduces pain, whereas others help digest any dead tissues in wounds. Lipases and proteases which break down foods and aid digestion are also present. Aloevera contains 2 hormones: Auxins and Gibberellins. These hormones provide wound healing & anti-inflammatory activity. Giberellin, in Aloevera acts as a growth hormone stimulating the growth of new cells. Lignin is Cellulose based substance, which provides penetrating power in Aloevera skin preparations and acts as a carrier for other components of Aloevera. Lignin takes the soothing properties of Aloevera down to damaged skin areas where it strips the toxic materials, increases the blood circulation to the area and flushes the dead tissue away. It is also keratolytic meaning it destroys and softens hard skin. Aloevera contains Salicylic Acid which is an Aspirin like compound that works as a pain killer. It possesses anti-inflammatory and anti-bacterial properties. Saponins which are Glycosides form about 3% of what’s in Aloevera gel. 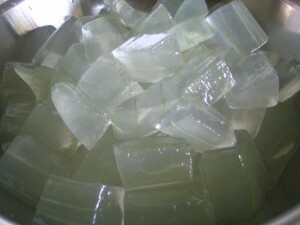 They are soapy substances which provide cleansing and antiseptic activity. They act powerfully as anti-microbial against bacteria, viruses, fungi and yeasts. Aloevera contains 4 main plant steroids: Cholesterol Campesterol Lupeol ß Sitosterol. These are anti-inflammatory agents. Lupeol also possesses antiseptic and analgesic properties. Aloevera contains the following vitamins: Vitamin A (Beta-Carotene) Vitamin B1 (Thiamine) Vitamin B2 (Riboflavin) Vitamin B3 (Niacin) Vitamin B5 Vitamin B6 (Pyridoxine) Vitamin B12 Vitamin C Vitamin E Choline Folic Acid. Vitamins A, C and E provide Aloevera’s antioxidant activity and neutralize free radicals. The “B” Vitamins and Choline are involved in amino acid metabolism, Vitamin B12 is required for the production of red blood cells, Folic Acid is required in the development of blood cells. Several different minerals have been found in Aloevera, following are the 10 most important ones: Calcium Chromium Copper Iron Magnesium Manganese Potassium Phosphorous Sodium Zinc. Aloevera contains 2 Monosaccharides: Glucose and Fructose. They provide anti-inflammatory activity. Aloevera also contains Polysaccharides. It provides number of benefits to the health of the person.